While making your own soap at home has become increasingly popular for those living frugally, as well as the Homesteader, it is a bit intimidating to some folks. This first in a two-part series about the benefits, and equipment needed, for soap making will explain some of the details and help you understand the process. In this day and age many consumers have become aware of the added chemicals, increased costs, and commercial processes used to manufacture personal hygiene items, including the soap we use to bathe ourselves, and families, with daily. The big producers are adding things that are considered toxic, can encourage diseases, cancers and other previously less common problems, including added fragrances and dyes that can cause allergies and skin afflictions. Because of increased knowledge of these unnecessary additives, there is a popular movement, particularly among the growing population of Homesteaders, to make soap at home. There are many ways of doing this, and a simple internet search will provide hundreds of recipes and methods. The majority of the recipes include the use of a mixture of oils, such as olive and coconut, and the addition of an agent to aid in the chemistry of soap making, such as lye. The recipes also generally include fragrances in the form of essential oils, and various other natural additives such as rosemary, oatmeal, lavender or corn meal. Making your own soap at home is one of the easiest steps you can take toward frugal living and creating a more natural and healthy environment for your family. 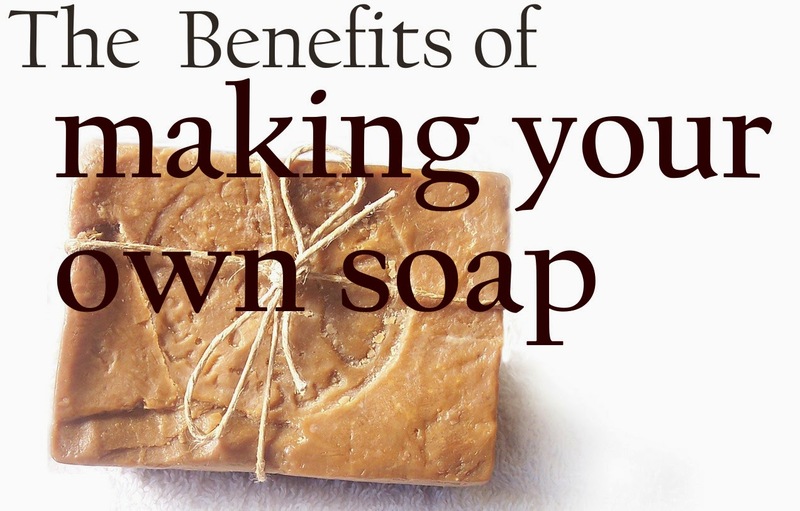 In this article we will discuss the benefits of making your own soap in three ways. First, we will talk about the undesirable ingredients that are found in commercially produced soap. Second, we will discuss the preferable ingredients that you can use to make your own soap at home. And third, we will look into the frugality and personal satisfaction of being able to create your own products, such as soap, at home. One of the most common reasons for making your own soap at home is for the health benefits that come from homemade soap. Store bought products often contain things like Alkali, which is the most common irritant found in store bought soap. This petroleum based detergent will not only dry out your skin, it will also give you that tight feeling that comes from stripping your skin of its natural oils. This is what we, as consumers in a commercial world, have come to regard as “clean”. Other undesirable chemical additives in this commercial soap include DEA, Isopropyl Alcohol, BHT and Triclosan. None of these are recognized, or properly utilized, by the human body and should not be included in our daily regimen. Triclosan is one of the most concerning of these chemicals. It is commonly found in anti-bacterial soap and is a culprit in preventing our bodies from creating our own strong immune system to fight off bacteria and infections. Although it has been used in products for over 30 years, recent studies are showing that the overuse of Triclosan has been proven to alter hormone regulation. The most common ingredient in commercially produced soap is sodium tallowate, which is, simply put, tallow, or beef fat. Given this list of undesirable, and sometimes unknown, ingredients used to make commercial soap, it is only natural that we would want to explore more desirable, natural ingredients to use for making our own soap for ourselves and our families. Making your own soap allows you to avoid all of those previously mentioned undesirable ingredients. While there is still a chemical process that must be followed to create a hard, usable bar of soap, there are many recipes available using more natural, body-friendly ingredients. The basic chemistry of soap making is that there is a reaction between water or liquid, oils and lye. Hearing the word “lye” is sometimes intimidating to those wanting to make a natural product. Many of us believe that lye is harsh, and is just another chemical. In fact, lye is naturally found and created by using the ash from a fire, and draining it through a water process. Lye, in the case of soap making, is simply the reactant to produce the cleaning, and consistency, that is needed to make a viable bar of soap. And in fact, once the soap making has gone through the saponification stage (the needed chemical reaction), there is no actual lye left in the soap. The choices of oils that can be used in soap making range from natural lard, to organic coconut or olive oils, with each adding a different level of moisturizing and skin soothing properties. Perhaps the most popular of these oils at this time is the Organic Coconut Oil. This oil is not only easily absorbed by the skin, it is extremely moisturizing. In addition Coconut Oil in the organic form has anti-bacterial properties, therefore offering a natural substitute for the undesirable Triclosan. Making your own soap at home gives you the opportunity to incorporate the many benefits of essential oils to not only scent your soap, but provide the individual properties associated with each oil. For example, the relaxing effects of Lavender Oil, the invigoration found in Lemon Grass, or the holiday inspiration of smelling a bar of Peppermint scented soap. The use of essential oils lets you be creative and develop your own personal scent for your homemade soap. While there are many bargains to be found, as well as sales, coupons, and other promotions, on commercially produced soap, there is a definite cost-saver with making your own soap at home. The initial investment in ingredients may seem like you are spending a lot, but most containers of the needed ingredients will supply you with multiple recipes worth of soap making. Each batch that you make will supply your family with a multitude of bars of natural, wonderfully fragranced, lather filled soap to use for bathing and washing. The utensils you purchase will last for years to come, and the initial cost will recuperate itself very quickly as you discover the benefits of using your own soap. Not only will you save the increasingly difficult to come by dollar, you will gain an incredible amount of personal satisfaction from making your own soap. The first time you experience the liquids and lye working through saponification, and then the pouring of the soap into molds, you will feel like you have had a major accomplishment. You and your family will revel in the marvelous creation of your homemade soap, as you secretly feel the pride of success and well being that making your own soap provides. There is always something to be proud of when you make your own products at home. This is no different with soap making. As mentioned above, you are able to create a more natural product for you and your family, you will save money doing so, and you will feel a sense of personal satisfaction and well being from the success of making your own soap. p.s. I shared this at the Our Simple Homestead Blog Hop! Alex, What a brilliant article! I didn’t know making soap was so simple! Do you have a video tutorial on making it? Or can you recommend one? Thanks for reading it! Soap making is fairly simple, but I definitely can’t say you won’t make mistakes! We still do, even after making it for so long. I don’t have a video tutorial. That’s something I would like to have…adding it to the list! I can’t think of any off the top of my head, but I’m sure YouTube is loaded with them!